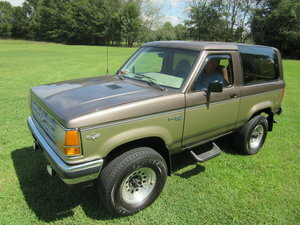 Outstanding 2-owner Ford Bronco XLT with only 23,000 original miles! Never abused, always garaged, and complete with all books, clean CarFax, & 2 sets of keys! A time capsule in every sense, also fully serviced for all our driver fans! Great color combination with classic exterior graphics! A must buy for 4x4 collectors!! The 2-door, off-road utility design known as the Bronco came about from Ford in 1966 as a response to Jeep’s success with the CJ-5, and the lesser known International Scout. These rugged mid-size Broncos were a great hit among buyers looking for an aggressive and equally inexpensive alternative. The first generation was produced through 1977, before a larger full-size model was introduced. Its major competitor being the Chevy Blazer as the closest USA produced truck platform. By 1987, a more refined “aerodynamic” front end smoothed out the grill, fenders, bumper, and composite headlights were introduced. ABS brakes became standard for added safety, and the interior offered a new dash, instrumentation, steering wheel and seats that made comfort and convenience a larger priority. Offered here is a fully loaded 1990 Ford Bronco XLT finished in Black and nicely appointed Grey Cloth interior! Powered by a robust 5.0L EFI V8 engine with 4-speed automatic transmission, and 3.55 rear axle ratio. Options include available 4-wheel drive, air conditioning, power windows, power locks, power remote mirrors, power rear window with defrost, cruise control, tilt steering column, center console with cup holders, AM/FM/Cassette/EQ audio system, trailer tow equipment, power steering, power front disc brakes, intermittent wipers, chrome outside mirrors, rear-mounted spare tire with cover, additional rubber all-season mats, passenger vanity mirror, 15” alloy wheels wrapped in newer Goodyear Wrangler Radial raised white letter tires, interior map lights, under hood service light, and more! 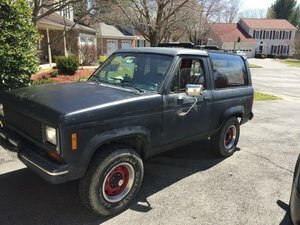 This Ford Bronco XLT has had only 2 registered owners from new! Showing only 22,950 actual miles, it is easily recognized as one of the nicest we’ve come across ever! It remains all original and unmodified throughout. A close inspection of the accident free body panels prove it\'s been a garage kept and dry when stored. The factory spot welds, door skins crimps, date-stamped panels, and factory inspection markings remain clearly visible and in excellent condition! The paint remains glossy and free of any major blemishes! This gorgeous all original Bronco has become a brilliantly kept future investment! Upon arrival to the St. Louis Car Museum the engine oil/filter & fuel filter were replaced, differentials topped off, front end lubed, brake fluid replaced, and the original a/c compressor and serpentine drive belt replaced for new. Everything is fully functional, and it’s ready to enjoy immediately! This example sold new from Tenvoorde Ford Motor Co on August 11, 1990 to John Maciejewski of Avon, Minnesota. This St. Cloud, MN establishment has taken claim from being the world’s oldest Ford dealership! It will come with all original owner’s manual, warranty booklets, and 2 sets of keys. He maintained possession with it in his heated garage until 2013, having never driven it in the rain or snow, before it would sell to a family friend. Once in the garage of Larry Melton, he would make only minor improvements by taking the liberty of replacing the original tires in 2013 along with the battery. He also parked it in a heated garage, adding just 107 miles to the odometer during his near 5 years of ownership. We feel this will make for a splendid future collectible for the off-road enthusiast, or professional collector of all-original specimens! Please feel free to call with questions or to schedule a chance to see the car first hand. Thanks for looking! 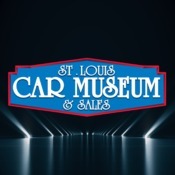 Established in 1991, the St. Louis Car Museum & Sales has provided motorcars, motorcycles and airplanes to collectors and enthusiasts around the globe. Our variety of inventory is a testament to our passion for special interest vehicles of all kinds. We actively buy, sell, and trade everything from antiques and classics to muscle cars and European sports cars, vintage motorcycles, airplanes, and automobilia. All vehicles are displayed in our 50,000 square foot carpeted and climate controlled showroom in St. Louis, Missouri just 5 minutes from Lambert International airport. Please call before arriving- vehicles may be viewed Monday thru Saturday by appointment only. Please call or email for information on our competitive consignment program and vehicle storage.